The Big Wobble: As 2017 declared among the three warmest years ever recorded will President Trump take the US out of the Paris pact? As 2017 declared among the three warmest years ever recorded will President Trump take the US out of the Paris pact? 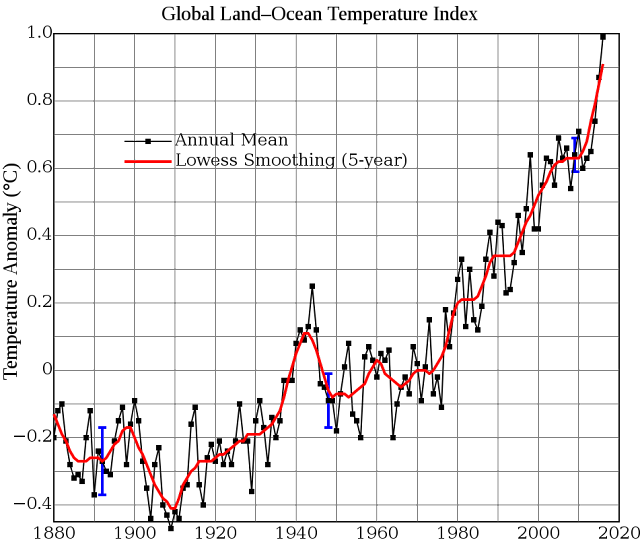 The global mean surface temperature change from 1880 to 2016, relative to the 1951–1980 mean. The black line is the global annual mean and the red line is the five-year lowess smooth. The blue uncertainty bars show a 95% confidence limit. Source: NASA GISS. WITH 2017 declared as the among the three warmest years ever recorded will President Trump take the US out of the Paris pact? The latest round of UN-led climate talks has opened in Bonn with delegates from almost 200 countries in attendance. It is the first major meeting since President Trump announced plans to take the US out of the Paris pact last June. Global temperatures are continuing to rise, 2016 was the hottest year on the historical record and the third consecutive record-breaking year, scientists say. This year is set to be among the three warmest years ever recorded since records began in the 19th century, the head of the U.N.’s weather agency said at the start of a 200-nation conference on slowing climate change in Bonn, Germany. According to Reuters, Petteri Taalas, Secretary-General of the World Meteorological Organization, said that 2017 would be slightly cooler than a record 2016. 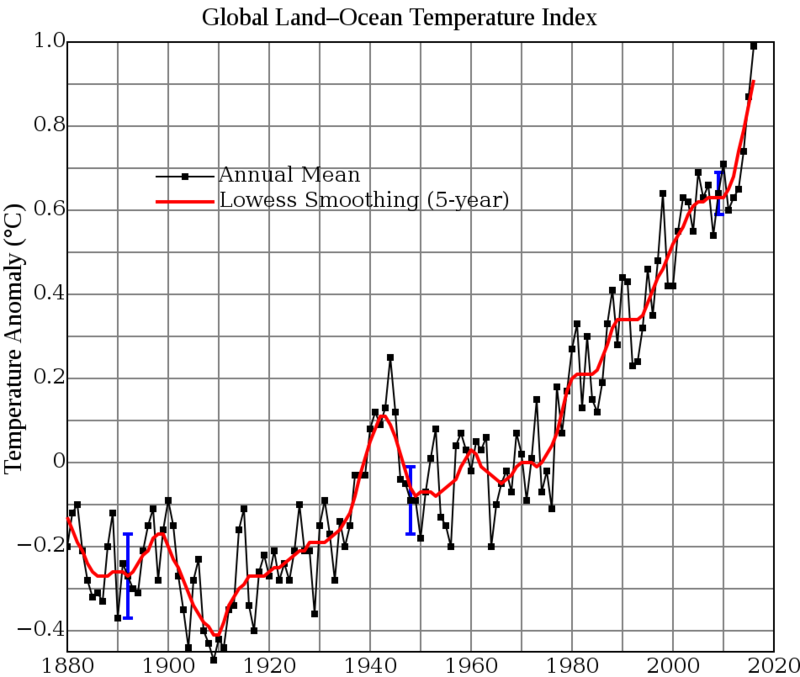 Of the 18 hottest years ever recorded, 17 have now occurred since 2000. Trump once dismissed climate change as a Chinese hoax to harm the U.S. economy and said in June that he would pull out of the agreement and instead promote U.S. coal and oil. A formal U.S. withdrawal will take until 2020. No other nation has followed his lead. U.S. influence is likely to wane compared to other big greenhouse emitters led by China, the European Union and India even though Washington will still have a place at the table in Bonn.